I just got done with Final Fantasy V, but I really want to experiment a bit more with the game (especially after listening to the Retronauts episode about it). 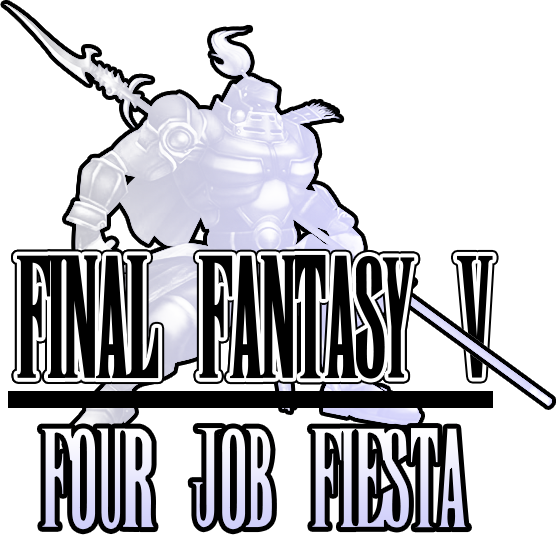 So what better way to do that then get everyone involved in a Four Job Fiesta! This was Val's idea, as he brought it up in the Scotty FF thread, but Val runs so many things around this forum that I'll take the lead here. If you're unfamiliar with the concept (as I was until, like, 4 days ago), here's how we'll do it. [INDENT]Players will be assigned one class from each crystal. Until all four classes are unlocked, players are only permitted to use the classes they have currently unlocked. Bare/Suppin/Freelance can only be used until the Wind Crystal job is unlocked. 2. There's a Twitter bot that handles everything, found on the aforementioned Four Job Fiestasite. It'll guide us through what we're each doing. oh wait you have to have a twitter? Hmm... I mean I could make an account again. You (or anyone else) could easily make a throwaway Twitter just for this, if you need to. I have like a million games in my backlog but screw it! I own FFV, but honestly don't know the first thing about it. Thanks for the offer------------maybe after I play through it once and understand the systems in place, I'll be more open to taking on some oddball challenge. Like, I wouldn't have taken on Test of Faith before I'd beat 'Mirror's Edge' just playin it regular. Probably wouldn't do a No-Sword Run or Nuzlocke anyway, but especially not on my first playthrough of LoZ or Pokemon. You know? M_K and Scotty added to the roster. ^Fair enough. The game is pretty awesome, if you ever get around to it. Although I've technically played FFV, I'm not sure if I even made it a minute into the game. As much as this is an interesting idea, it probably isn't an ideal way to do a first playthrough. ^You and [USER=17381]@Booyakasha[/USER] should just do a regular run while the rest of us are doing this jazz. I'd like to, but a dozen was an understatement of my JRPG backlog. I'm trying to avoid extending that list in the interest of clearing it within the next decade. I don't have a Twitter either. I was planning on just using a random number generator to pick my jobs. Y'all can pick jobs however you want, as long as it's still random and fair. All right, I say we start this tomorrow morning, with the goal of finishing by August 31. Recruit friends if you like. so I think I might be set up to stream this, I'll let you know in thread whenever I do! ^Nice! If I emulated the SNES version, I could do that as well. But we're in the middle of moving (to your backyard, Kat!) so I wouldn't really have the capability. I made my first roll. Aaaaaand I got White Mage. On the one hand, I'm relieved, because I won't have to worry about healing at all. That will save me a lot of gil grinding. On the other hand...my trip from the Wind crystal to the Water crystal will be interesting. Marilink - 1. White Mage 2. ??? 3. ??? 4. ??? Val - 1. ??? 2. ??? 3. ??? 4. ??? M_K - 1. ??? 2. ??? 3. ??? 4. ??? Scotty - 1. ??? 2. ??? 3. ??? 4. ??? My First roll is a Knight. First time in a Fiesta Run - official or unofficial - That I get to use a big sword.